Since the book Men Are from Mars, Women Are from Venus was first published in 1992, much has been made of the differences between men and women with regard to sensibilities and personal needs, among other characteristics. Probably too much. But as anyone who has worked in eye care knows, there are important distinctions between the genders when it comes to eyewear preferences. And, while it’s important not to generalize based on gender alone, having a better understanding of the vision needs and buying habits of men can only help to address them successfully at the dispensing table. 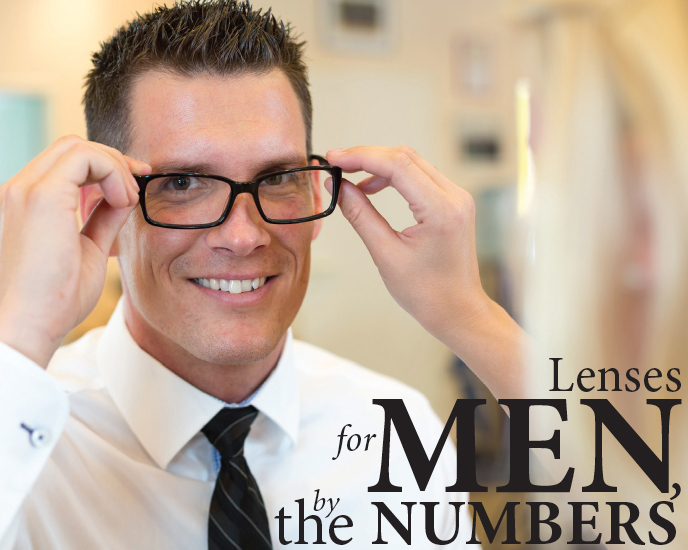 According to Toronto-based market research company NPD Group, the biggest preference for men when making a buying decision about apparel – and let’s face it, eyeglasses are the ultimate in apparel – is sticking with a brand with which they’ve had previous experience and/or success. They also prefer products that fit with their overall style (interestingly, contrary to stereotypes, men value style more than women, according to NPD), those that have the features and benefits they want, and that offer good value for the money. They also value comfort over affordability. These tendencies shouldn’t necessarily influence the spectacle lens products you offer to men but they should impact how you position those products. For example, if you think a spectacle-wearing male client, who already wears standard progressives by Brand X, might benefit from an upgrade to a free-form lens, offer him Brand X’s free-form product – and make a point of mentioning that you are doing so. In addition, remember that several lens manufacturers advertise their brands to consumers across Canada. Based on NPD’s findings, it makes sense to reinforce these advertising messages via the merchandising in your dispensary so that your clients recognize them and know that you carry them. A 2012 survey by Integer Canada revealed that when shopping, the majority of men (60 per cent of respondents) want to get in and get out of the store as quickly as possible. Keep this in mind when explaining the features and benefits of spectacle products to male clients. Yes, the technology can be complicated – particularly with free-form lenses or photochromics – but long-winded explanations may result in men leaving the dispensing table without making a purchase. Rehearse succinct sales pitches that focus on the most important features and benefits, but also be prepared to answer any questions your clients may have. In a similar vein, Hamilton, ON-based retail and marketing strategy firm Clulow & Associates notes that men view shopping as a “mission,” whereas women view it as a “social event.” As a result, men tend to shop alone while women often shop with friends. At the dispensing table, men may be prone to ask their partners for advice on frame purchasing decisions, but on lenses they’ll likely make the decisions themselves – so sell to them, not their partners. The 2012 Integer Canada survey also found that men are less price-conscious than women – only 39 per cent of survey respondents said that they looked for fewer or cheaper items when shopping. This is good news for eyecare professionals who want to upsell to premium lens products and/or second-pair sales. Coupled with the NPD Group’s findings, it’s up to eyecare professionals to convince clients that premium lens products offer good value for the money. Ultimately, eyecare professionals need to “read” the personalities of each client as well as their unique visual needs. A greater understanding of gender differences can only assist in this process, particularly when the product is as complex as spectacle lenses.